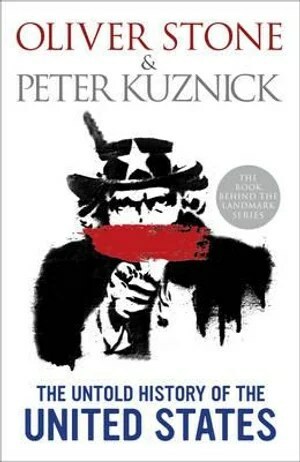 Last week, I finished reading Oliver Stone and Peter Kuznick book The Untold History of the United States. The authors of this 600+ page volume also created a 10 episode miniseries for the Showtime Network (I assume that this was Stone’s principle role in the project as he is the narrator of the episodes) which provides a more cursory but accessible overview of the book’s subject matter. Full disclosure: I haven’t finished watching the entire miniseries. The book itself is a well researched if one sided view of American history and foreign policy. Peter Kuznick (who has a great mustache) is a well regarded historian of American History at American University . The 600 pages of text are accompanied by approximately 100 pages of citations many of which are associated with some of more damning pieces of evidences that the authors put forward about the roots of American Empire. Citing meeting transcripts, declassified documents, biographies and interview texts they attempt to dispel how history records many American actions being made with altruism, benevolence and self-sacrifice in mind rather the authors call out Presidents that claimed they were acting in the name of “maintaining world peace” or “protecting democracy” as really driven by an ideological quasi-imperial ambitions (Manifest Destiny and/or the Project for the New American Century). The book’s narrative begins in the late 1800s describing America’s first foray’s onto the international stage after the Civil war. From its rather careless efforts to battle the Barbary Pirates in the Mediterranean culminating in the America’s victory in the Spanish-American War. It was from the outcome of this conflict that Stone and Kuznick start their narrative in earnest with the “founding” of American Empire. The book then continues into World War One and its aftermath all the way through the War on Terror and the drone policy of President Obama citing key figures and turning points in time. The author’s point of view is unabashedly liberal in its outlook. The book attacks, American corporatism as a cause of and driving force behind American Empire. Citing the greed of American corporations being the cause of repression and interventions in Latin America and the Caribbean (from 1900-1980s); to the “merchants of death” of the First World War who sold weapons to both sides during the conflict to the titans of industry that called for a permanent war footing following the victory over the Axis powers in World War Two and who continue to lobby Congress over defense spending. This greed driven capitalism is then linked to American militarism as generals and presidents pushed for the armed interventions and invasions in nations that opposed US policy or threatened us interests (including corporate ones). This examination of militarism is taken one step further when the authors probe into America’s nuclear policy during the Cold War and the cavalier nature that politicians and military commanders discussed, planned and even advocated for the use of nuclear weapons. In contrast to this, Stone and Kuznick wistfully highlight groups that opposed this imperial driven corporate militarism. From the labour unions that were crushed in the 1910-1930s who demanded fair wages and a better quality of living for all men. To the Red Scare and the purges of government and corporate American of “communists” and “socialists” in the late 1940s and early 1950s. Followed by the rise of the civil rights and peace movements of the 1960s and 1970s and concluding with a brief mentions more modern movements like Occupy Wall Street and Anti-Drone activism. While examining the various aspects of American history, the authors also focus on key turning points, tempting the reader with a series of “what ifs” as they progress though time. From the successful effort of US Senators to derail Woodrow Wilson’s 14 Points after World War One. To the story of how Henry Wallace, a devout progressive and Roosevelt’s Vice President from 1940-1945 was a mere 9 seconds away from being renominated over Truman. To Kennedy and Gorbachev’s plans for nuclear disarmament that were cut short by an assassins bullet in Dallas and the controversial Presidential election of 2000 where George Bush won over Al Gore in a hotly contested campaign that ended up at the Supreme Court. The authors don’t offer much in the way of speculation on how things would have been different but they connect these “what ifs” with the negative consequences that they perceived occurred as a result of these turning points. To their credit, I did find myself pausing and wondering “what if” and mentally gaming out scenarios had history been different. Overall, Stone and Kuznick’s book (and from what I have watched from the miniseries) provides a good insight into aspects of American history that are often overlooked or overshadowed by other events. Although it is unlikely that history is truly as black and white as the authors portray it, the book despite its length is worth your time if you are interested in American history.